AN atypical case of Bovine Spongiform Encephalopthy (BSE) has been detected in Poland, but poses no risk to human health and will not affect the country’s official BSE status, according to health authorities. The World Organisation for Animal Health (OIE) has confirmed atypical BSE was detected during routine screening on January 24 in a cow near the village of Mirsk in south-western Poland, an area bordering the Czech Republic and Germany. The cow was subsequently put down and did not enter the food chain, Poland’s chief veterinarian said. Atypical BSE can occur spontaneously in all cattle populations at a very low rate and this event would not have have any influence on the official BSE risk status of Poland, the OIE said. Poland’s first detected case of BSE occurred in 2002 and it’s most recent case prior to this detection occurred in 2013. The discovery comes as Poland’s cattle industy deals with the fallout of a public food safety issue. EU experts arrived in Poland yesterday to investigate a suspect beef scare that saw a Polish slaughterhouse allegedly evade controls to butcher sick cows and export the meat to some 13 other European Union members, including Estonia, Finland, France, Hungary, Lithuania, Portugal, Romania, Spain, and Sweden. A Reuters report said several countries have started to reduce the amount of beef imported from Poland in the wake of the scandal, which was reportedly uncovered through secret filming by a Polish television broadcaster. Polish government officials have denied that sick cows were slaughtered for meat. No EU member country has yet completely cancelled meat imports, the Polish Meat Association has told the media. However Polish beef prices have started to fall in recent days, with the Polish cattle producers lobby telling Euronews producers stand to lose about 600 million zloty (about AUD $220 million) as a result of the issue this year. 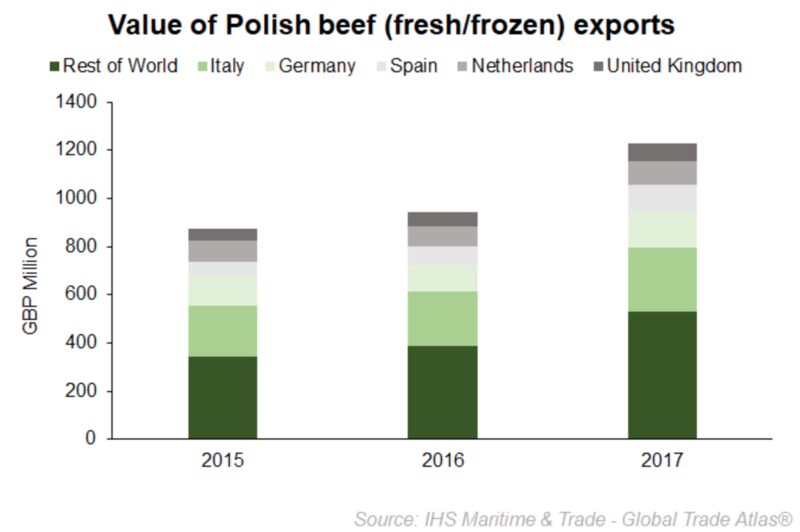 Poland exported 85,500 tonnes of fresh and frozen beef in 2017 (2018 data not yet available), with primary destinations including Italy, Germany, Spain, Netherlands and the UK (as per chart below).